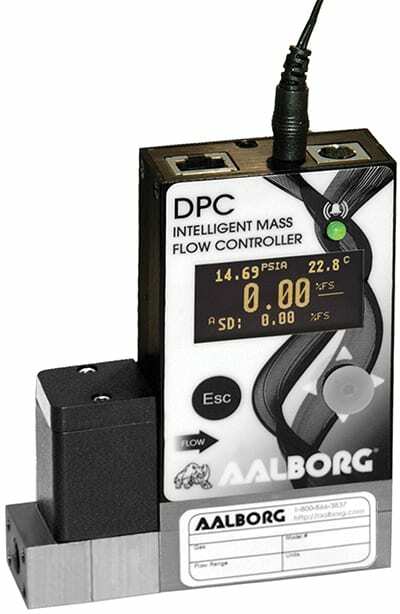 The DPC Series of precision digital mass-flow controllers for process gases (photo) provides simultaneous display of mass flow, volumetric flow, pressure and temperature parameters in scientific and analytical applications, bioreactors and surface depositions, gas sampling, manufacturing and metrology activities. DPC differential-pressure mass-flow controllers feature totalizers with batch processing mode, 200:1 turndown ratio and less than 150 ms response time. The devices’ multi-gas functionality supports 90 different gases and gas mixes, and the user-defined mixture functionality allows for the creation of up to 20 custom gas mixes with up to five different gas components in each mixture. — Aalborg Instruments, Orange, N.Y.